When we think about viruses we tend to consider ones that afflict humans—such as those that cause influenza, HIV, and Ebola. Yet, vastly more viruses infect single-celled microbes. Diverse and abundant, microbes and the viruses that infect them are found in oceans, lakes, plants, soil, and animal-associated microbiomes. Taking a vital look at the "microscopic" mode of disease dynamics, Quantitative Viral Ecology establishes a theoretical foundation from which to model and predict the ecological and evolutionary dynamics that result from the interaction between viruses and their microbial hosts. Joshua Weitz addresses three major questions: What are viruses of microbes and what do they do to their hosts? How do interactions of a single virus-host pair affect the number and traits of hosts and virus populations? How do virus-host dynamics emerge in natural environments when interactions take place between many viruses and many hosts? 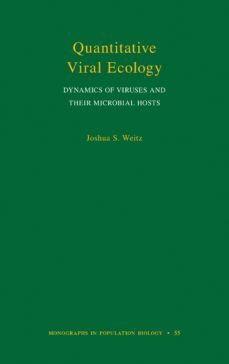 Emphasizing how theory and models can provide answers, Weitz offers a cohesive framework for tackling new challenges in the study of viruses and microbes and how they are connected to ecological processes—from the laboratory to the Earth system.Quantitative Viral Ecology is an innovative exploration of the influence of viruses in our complex natural world.